*넷익스플로러, 사파리, 파이어폭스에서 제대로 실행됨. 스마트폰 실행 권장하지 않음. *compatible with Internet Explorer, Safari, and Firefox. not recommended for viewing on Smart phones. 는 사무소의 작은 창고에 쌓여있는, 만들어진 지 10년도 넘은 미술가들의 포트폴리오와 전시 도록, CD 및 각종 서류들에서 이미지와 텍스트를 부분적으로 잘라 만든 아카이브다. 미술을 둘러싼 의사 소통과 리서치, 전시에 관련된 자료들로부터 현재 우리의 도시 환경과 생활의 일면을 본다. 이미지와 텍스트는 흩뿌려진 전단지처럼 팝업 형태로 웹공간을 빽빽하게 도배한다. www.samuso.org / 2012년 1월 15일 00시 부터 1월 22일 00시까지 오픈. The Grand Rapid Archive is a web-archiving work featuring fragmental images and texts selected from an old stockpile of portfolios, exhibition catalogues, compact discs, documents, etc. which has been stored for more than 10 years in a small storage at SAMUSO. The work shows various aspects of our urban life now and here, through discourses, research, and documentations regarding art exhibitions. 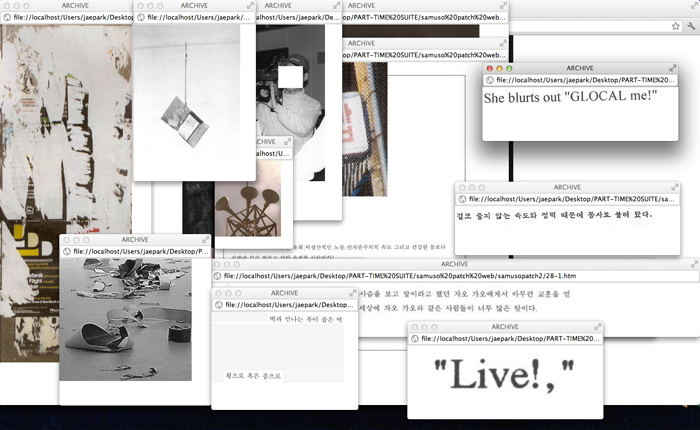 Like flyers being scattered, the images and texts covers the samuso.org website in the form of pop-up announcements.